UPDATE #2 May 25: Now that the summit has been canceled, Gardner is still saying his North Korea policy forced the Kim Jong Un to agree to the summit. Gardner on KOA 850-AM: “It’s that pressure that we brought to bear that actually made this summit possible in the first place, that pressure that started working in ways that we never imagined possible. And so we have to continue this pressure. We have to continue this approach. And we have to make sure that China and other countries around the world uphold to that very strict and rigorous sanctions regime. And now Gardner’s policy can take credit for the failure of the summit. UPDATE: In an NPR interview today, Gardner said he talked to Trump, and Trump agrees that he will not meet with Kim Jong-un without preconditions on denuclearization. For Gardner, this represents a flip back to his old position of insisting on precounditions. Gardner had abandoned this stance (See below.). For the president, it appears Trump hasn’t advocated this stance publicly, only in private to Gardner. HOST (at 1 min 45 sec):You told The Daily Beast that there shouldn’t even be a summit if there’s no– as you just said — verifiable, irreversible path to denuclearization. So you clearly think that would be a precondition for these talks. You’ve been talking with President Trump about this. Does he agree with you? Does that sound like the same senator who praised Trump’s outreach to Kim Jong-un as positive? As recently as November, Gardner was warning against any talks without preconditions. Gardner: Moreover, before any talks in any format with North Korea, the United States and our partners must demand that Pyongyang first adhere to the denuclearization commitments it had already agreed to in the past – and subsequently chose to brazenly violate. What changed? Gardner didn’t return a call seeking comment, but judging from his media statements, it looks like his official explanation might be that North Korea has changed due to economic sanctions by the U.S. and others. But everything changed in just six months? More likely: Gardner didn’t want to stand up to, or even criticize, Trump on the issue, especially because Gardner once claimed that he had Trump’s ear on North Korea policy. That’s in keeping with Gardner’s stance toward Trump on many issues, as seen in Gardner’s 91 percent score of voting in line with the president and Gardner’s depressing silence on one pathetic and bizarre Trump antic after another. I wonder how Gardner will spin any "agreement in principle" reached by the Trump/Pompeo regime during negotiations with a state "doesn’t play by the rules." Wait … You're saying Cory Gardner is a TOTAL HYPOCRITE? I'm shaken to the core of my being. 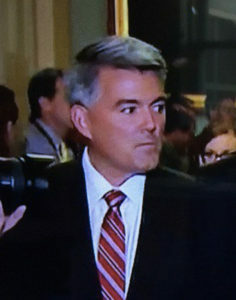 What Corwardly Gardner sees from his stay-the-course vantage point, on his knees in front of trump or some other kochs, probably needn’t be reported. Try talking smack about Clarice Navarro, Judy Reyher, Becky Mizel, or some other colorful Pueblo personalities. Or heap praise on County Clerk Gilbert Ortiz, who is advising city council on the upcoming mayoral election. Those things ought to rouse Modster from hibernation. By the way, Moddy – Ha ha! Pueblo educators won a 2% cost of living increase, and other benefits, by collective bargaining and striking! I don't want to be underneath what trickles down from all that stroking!